The long lost Forest Fingers (Caladenia sylvicola)? One of the largest orchid genus in Tasmania must be Caladenia, of which the island (including the smaller islands off the state) boasts 36 species. That makes it one of the largest genera of plants in Tasmania. While members of the Caladenia are a morphologically diverse, they are readily recognizable by gist in the field. There are at least 2 different forms: the small flowered ones are more commonly known as Finger orchids while those with long sepals and petals are usually known as Spider orchids. 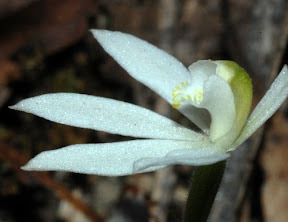 Just in the bush around Hobart alone, at least a third of the 36 Caladenia species occur. 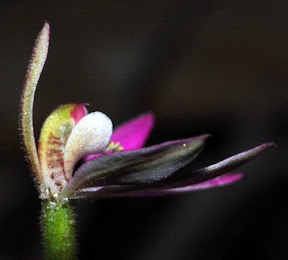 One of them, the small flowered Caladenia sylvicola (Forest fingers), is an endangered orchid with very few known records. 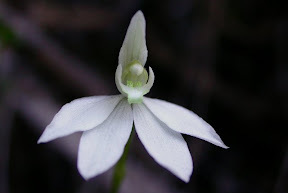 According to The Orchids of Tasmania, the species was first collected in 1992 in a locality near Dynnyrne, under heathy Silver Peppermint (Eucalyptus tenuiramis) forest. A larger colony was later found in 1994 in the same vicinity. 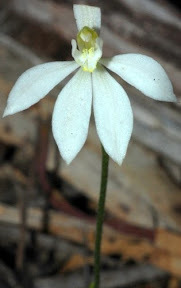 In my visits to the area I have found two species of Caladenia co-occurring there. These are namely Caladenia carnea (Pink Fingers) and C. fuscata (Dusky Fingers). 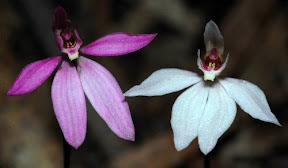 In the species key given in Orchids of Tasmania, C. sylvicola is distinguished from C. fuscata and C. carnea by the lack of the pink, red or purplish bars that streak the column. On the 16th October 2004 I was botanizing in a bush near the Waterworks Reserve and I stumbled on a strange looking Caladenia, growing amongst a vibrant population of C. fuscata. This mystery orchid was totally white and had yellowish calli (protuberances found inside the column of many orchids). There was only one plant and I figured it was just a white form of either C. fuscata or C. carnea. In the Orchids of Tasmania book, the description for Caladenia sylvicola was the closest match to what I had found. If my identification is correct, that would the first time it has been seen for over a decade. Apparently, the esteemed photographers from the Up Close website had also encountered a similar orchid which they left unnamed. Unfortunately, they left no date or location on their website as to when they photographed the flower. In any case, I did not see the presumed C. sylvicola for another 5 years, despite serious searchs. Then this year, on the 22 Oct I spent an evening orchid hunting around the vicinity and spotted a single ghostly white orchid. It has a slightly damaged dorsal sepal but in all respects was similar to the one I had seen half a decade earlier. Again, this single specimen was co-occuring with large number of C. fuscata (Dusky Fingers). I also know from past encounters that the area is also a haunt of C. carnea (Pink Fingers). Could C. sylvicola just be an aberrant albino or just a pure white form of C. fuscata or C. carnea? C. carnea tends to be a bit larger and taller than C. fuscata and C. sylvicola. C. carnea also has the ability to bear two flowers per scape, a feature not observed in C. fuscata and C. sylvicola. It is unlikely then, to be confused with C. sylvicola. With C. fuscata however, other than the pink bars on the column and the coloration of the petal, sepals and calli, there were little other morphological features differentiating this species and C. sylvicola. In the aspects of stature and calli arrangement, the two were indistinguishable. I did not collect the single specimen of the presumed C. sylvicola as it would be a legal offense to collect threatened plants. However, I did take a long hard look at the calli of both species in the field and could not discern and any differences in the arrangement of the calli. With the exception of colour differences, both had two rows of calli extending into the column in a similar fashion. Also, C. fuscata in the area exhibited a wide range of colour from deep pink to white, with white ones occurring at a much lower frequency. In the latter case, there are red/purple streaks marking the labellum and column as with the typical pink forms. The idea that C. sylvicola may be a totally white form of C. fuscata may not that hard to believe. I use the example of an orchid of another genus, Chiloglottis. The Small Bird orchid (Chiloglottis grammata) is typically dark purplish brown but greenish purple and pure green forms exist. Yet by virtue of their calli patterns the green and dark purplish-brown forms are all called Chiloglottis grammata. Another argument would be that the two times I have sighted the presumed C. sylvicola, they popped up in the middle of a healthy C. fuscata population, the latter species displaying different shades of petal and sepal color ranging from deep pink to white. It is therefore easy to conceive of C. sylvicola as just being at the farthest extreme of the color and pattern themes of C. fuscata. Other questions arise from this mental workout. If C. sylvicola is a real species, could it have evolved from C. fuscata, perhaps by mutation? If so, C. sylvicola doesn’t look like a species that is doing too well. What these speculations need are scientific studies using a combination of morphological and molecular analyses. Some workers have already developed, from some species of Chiloglottis, certain DNA markers called microsatellites. These microsatellites, if they can be developed for Caladenia, can be useful in finding out the relationship between C. sylvicola, C. fuscata and C. carnea. There really is much we have yet to know when it comes to orchids. But then again, isn’t it the same for just about anything? 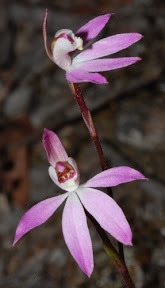 This entry was posted in Botany, Orchids, Plant Morphology and tagged Caladenia, Caladenia fuscata, Caladenia sylvicola, calli, Dusky fingers, Dynnyrne, Finger orchids, Forest fingers, microsatellite DNA, orchid, Orchidaceae, Orchids, Pink fingers, tasmanian orchids, Threatened Plants, threatened species, threatened Tasmanian plants. Bookmark the permalink.